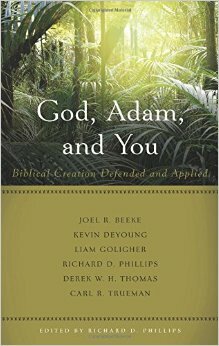 God, Adam, and You: Biblical Creation Defended and Applied. Edited by Richard D. Phillips. Philipsburg: Presbyterian & Reformed, 2015. 210 pages. $14.99. Church leaders must be noticing something. This is at least the third book in 2015, written by confessional Reformed and Presbyterian authors, defending the biblical doctrine of creation. Consider how Joel Beeke opens his essay in the book at hand, “Carl Trueman has written that the historicity of Adam is the biggest doctrinal issue facing this generation” (15). 2015 has already seen William Van Doodewaard’s Quest for the Historical Adam: Genesis, Hermeneutics, and Human Origins (RHB, 2015). It is a tour de force, surveying in 400 pages the entire history of the church’s stand regarding the historical Adam. A much shorter work has also just been published by Richard Gaffin, entitled, No Adam, No Gospel: Adam and the History of Redemption (P&R, 2015). He mounts an exegetical defense from Scripture of the teaching that all human beings descend from Adam. The volume at hand, God, Adam, and You: Biblical Creation Defended and Applied contains ten essays, edited by Richard Phillips, a minister and prominent leader in the Presbyterian Church of America. The essays were composed by well-known professors and pastors: Joel Beeke, Kevin DeYoung, Liam Goligher, Richard Phillips, Derek Thomas, and Carl Trueman. It’s noteworthy that all of these men are noticing the need to defend the biblical teaching of creation. They’re not doing so simply because evolutionary teaching is out there in the world, but because it is making remarkable inroads in the church. The essays first saw life as speeches at the Philadelphia Conference of Reformed Theology, sponsored by the Alliance of Confessing Evangelicals, in 2013. As the footnotes in this book demonstrate, these scholars were well aware of the radical trajectory of Peter Enns and the compromising views of Bruce Waltke and Tremper Longman III—all of whom had once taught Old Testament at confessional Reformed seminaries—as well as the white paper of Tim Keller and other postings at the Biologos website. These things gave their conference (and this book) a sense of urgency. Theistic evolution, in various forms, was and is being promoted among Christians via speeches, conferences, courses, and educational centres. For example, since 2008 the Biologos Foundation in the United States and the Faraday Institute in Great Britain have received huge grants from the Templeton Foundation to promote evolution among Christians (Biologos has received about 9 million dollars since 2008, to be precise $8,735,123). More about all this another time, D.V. This just to say that defending biblical creation is an urgent and timely matter. Those in the know are probably not surprised at the appearance of creationwithoutcompromise.com. God, Adam, and You contains some very fine essays. Most are written at a grade 10 or lower reading level and most are quite understandable to the average reader. Some will move you to praise the Lord as you contemplate his greatness in creating this beautiful world. This is what Derek Thomas first highlights: creation exalts God (3–8)! Overall, the book’s authors advance a clear antithesis between creation and evolution. The question of what it means that God created Adam and Eve in his image returns several times. To read the rest of this review, click here.